The word Navaratri literally means nine nights in Sanskrit. There are three Navaratris commonly celebrated out of which the Sharada Navaratri, which is celebrated during beginning of winter (Sept-Oct) is the most popular and significant one. Durga, Bhadrakali, Amba or Jagadamba, Annapurna, Sarvamangala, Bhairavi, Chandi, Lalita, Bhavani, Mookambika. In another version we see TEN forms of Shakti, called the "Dasa Mahavidya". Ete dus mahavidya sidhdhavidya prakirtita. (Kali, Tara, Mahavidya, Shorashi, Bhuveneshwari, Bhairavi, Chinnamasta, Dhumavati, Vagala, Matangi and Kamala are the ten mahavidyas). The "Brihat Dharma Purana" descibes the mythology of how these ten "figures" appeared. According to this mythology, Sati, wife of Lord Shiva, wanted to go to her father's house, because her father, Daksha, was organizing a huge "yagya" (fire sacrifice). However, Daksha had not invited Lord Shiva to go and attend, so Shiva advised Sati not to go there. This angered Sati so much that fire emitted from her third eye, and she changed into Kali, a dark skinned Devi. Scared Shiva also saw these ten forms at that time. In the South Indian states of Tamil Nadu & Karnataka, Sharad Navratri is celebrated by setting up of Bombegalu. The last four days of Sharad Navratri is celebrated as Durga Puja in the state of West Bengal. 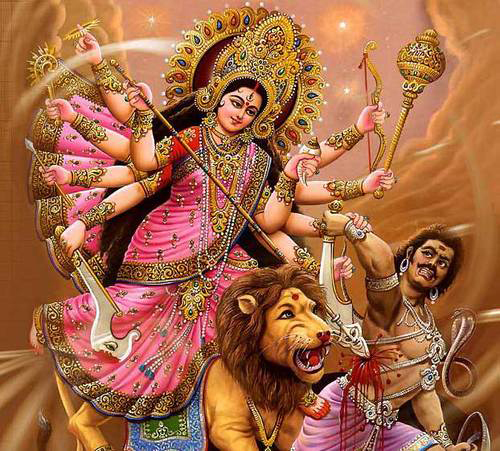 It is thought that Durga, the divine mother, had destroyed the evil force (in the form of the demon Mahisashura) during this period.This is the biggest festival of the year in this state. In Western parts of India, Sharad Navratri is celebrated with the famous Garba dance. In northern India, especially in Varanasi, Dusshera overlaps with "Ramlila" or "Rama Drama" - traditional plays in which scenes from the epic saga of the mythical Rama-Ravana strife are enacted by professional troupes. In Ramlila, the tenth day, popularly known as Dusshera, is celebrated as the day of defeat and death of the demon king Ravana in the epic Ramayana. Navaratri is divided into sets of three days to adore different aspects of the supreme goddess. On the first three days, the Mother is invoked as powerful force called Durga in order to destroy all our impurities, vices and defects. The next three days, the Mother is adored as a giver of spiritual wealth, Lakshmi, who is considered to have the power of bestowing on her devotees the inexhaustible wealth. The final set of three days is spent in worshipping the mother as the goddess of wisdom, Saraswati.